Children of all ages are welcome in our worship. For parents who choose, nursery care is offered during the 10:00 a.m. service for young children through 4 years of age. All attendants have had satisfactory background checks and their references have been verified. Also all are certified in the Diocese of East Carolina “Safe-Guarding God’s Children” training. For more information, ask an usher. 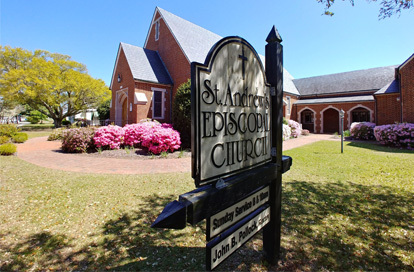 St. Andrew’s is located on the sound-side of Arendell Street between 20 th and 21 st Streets. Our main parking lot is in the rear of the Church off Evans Street. Parking is also allowed along the south side of Evans Street. The church can be entered from the front via the alleyway along the west side of the building. Follow the signs directing you to the sanctuary.